A colour Doppler study is done prior to surgery to make sure that the arteral blood flow is adequate. The vein is viewed to see its size and any blockages. Grafts are avoided if there is an ongoing infection. In the unfortunate occurance of infection the grafts must be removed otherwise infection can never be brought under control and the patient could become very sick and septic. In both the cases blood flows from the artery to the vein, dilating it and also strengthing it. By this procedure a large amount of blood passes through the vein rapidly which helps dialysis to proceed efficiently. This is preferably done under local anesthesia unless the patient is very anxious when sedation is given. It is constructed using a single incision at the wrist or the elbow. After the formation of the AV fistula or graft elevate the limb to avoid swelling. If there is prolonged pain, numbness, coolness or blueness of the fingers or hand please inform your surgeon and much of the blood is being diverted from the hand into the fistula. This is called 'Steal Syndrome'. One must perform hand exercise to increase flow of blood into the fistula. 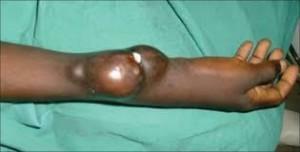 This is done by squeezing a soft ball with the hand with fistula. Check often to make sure the fistula is working by feeling the vibration known as thrill. Monitor the bleeding after dialysis. Should it continue for long take advice. Do not sleep on the arm with the access. Do not wear constricting clothing or jewelry on the arm with the access. Keep the site of the fistula or graft clean. 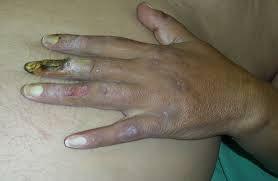 Do not apply any cream or lotion over the site of the fistula or graft. It is done under general anesthesia as a day case. The PD catheter is the length of a ruler and the width of a pencil. During surgery one end is placed in the peritoneal cavity and the rest of the catheter lies outside the abdomen thoiugh it is tunnelled below the skin. 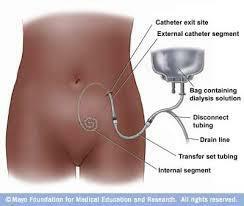 There are two ways of placing the catheter – laproscopic or surgical. In the former two toney incitions are made under genral anesthesia – one for the scope and the second for the catheter. In surgery an incisioni is made and the catheter is placed in the abdominal cavity. It is tunnelled under the skin to avoid infection. Infection is prevented by using a tube with a valve at the end which is used to close and open the catheter during the exchnage process to avoid infection. To strengthen the fistula you may have to exercise the limb by sqeezing rubber ball. How are AV Grafts placed in hemodyalysis? This is recommended of the veins are blocked or too small in calibre. Synthetic tube is inserted in your arm and connected artery to vein. If the arm for the fistula has to be used then use the hand veins and sites are rotated frequently. AV fistula has a better survival than AV Graft. Studies show an equal survival on peritioneal dialysis and hemodialysis. Thus peritonel dialysis is preferred to central venous lines. Oedema in the limb here fistula is planned. Accessory vein enlargement in any planned access site. Differential extremity size if it is planned as access site. Central line in subclavian vein in the planned side. Pacemaker in the venous drainage of the planned side. What is the best timing for AV access, its placement and its maturation? Fistula is advised when the GFR is 15-20 ml/min and there is progressive renal disease. It is important to make the fistula 3-4 months before the anticipated use of the fistula. Permachaths are put immediately before the dialysis as they need no time to mature. However there is a chance of infection, thrombosis, and dialysis inadequacy. The tip must be beyond the SVC in the right atrium which is confirmed by radiography. Insertion is guided by ultrasound to avoid complications. The patients with chronic renal disease needing acute hemodialysis vascular access use percutaneous inserted catheters. They are inserted just before use. Femoral catheters must be at least 19 cm long to reduce recirculation. They are left so along as there are no complications. AV fistula maturation depends upon the size of the artery, the vein and the cardiac output. The time of use depends upon clinical judgment. Arm and hand exercises by squeezing a rubber ball with lightly applied tourniquet. Selective tying of the major veins side branches. 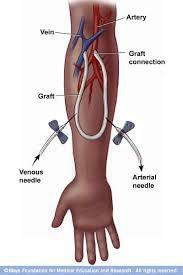 AV Graft should not be cannulated till the swelling is reduced and the graft is palpable along its course. This takes 3-6 weeks. If the swelling does not respond to elevtion or persists beyond 2 weeks of placement use venogram or non-invasive study to evaluate central veins. Perform angiography of the fistula flow falls below 500ml/min and AV Graft below 650 ml/min. Using access recirculation measures one must be aware that the recirculation is abnormal and has to be investigated. Recirculation of > 5% using non-urea based measures or > 15% using urea based methods significant and needs angiography. Persistent swelling of the arm with AV graft. 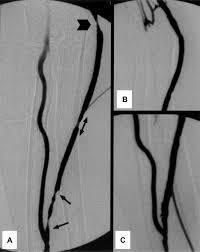 Any finding of access dysfunction using any technique must be investigated by an angiogram and corrective measures taken – angioplasty or surgery. In the period before corrective measures can be undertaken because the dialysis circuit exceeds the access flow, access recirculation leads to inadequate dialysis. If this occurs then the dialyser flow is reduced to below measured access flow. Teach patients and staff on infection control. Change dressing each time after dialysis using gauze and povidon iodine ointment. Catheter care and measuring flow is done in the sterile way. By this technique trials showed a significant reduction in stapholococcusaurius, reduced incidence of bacteremia and catheter tip colonization. 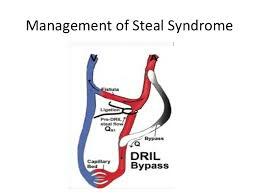 Use of angioplasty in significant stenosis of AV Fistula or AV graft. If this is not possible then revision is done. In AV fistula aneurysm intervene only of the overlying skin is compromised or the aneurysm is expanding or there are limited puncture sites. AV graft surgery is done if the graft is degenerated or pseudo-aneurysm is present. The commonest site of stenosis or thrombosis is near the AV anastomosis. AV Fistula stenosis and angioplasty. After correction the parameters should return to within normal limits of patency. Thrombosis should be corrected within 24 hours and the venous access then evaluated for a stenosis by doing a fistulogram. Outflow venous stenosis is presnt in > 85% of the thrombosis in AV grafts. Angioplasty or surgical correction is performed. Thrombolysis followed by angioplasty – 40% unassisted potency at 3 months. Immediate patency 85% in both techniques. The use of aspirin or wafarin in graft and fistula thrombosis has not been very encouraging. 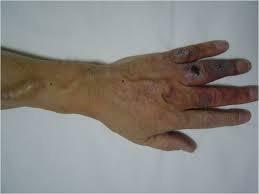 Treat hand ischemia due to arterial steal with distal revascularization along with internal ligation procedure. If not possible then ligation of AV graft or AV fistula. Treat central vein thrombsis with angioplasty and stenting if necessary. Central vein stenosis may cause marked limb swelling with AV access on the same side. Percutaneous angioplasty is helpful and if this repeatedly occurs then a stent is placed. This is failure to perform hemodialysis based on catheter related thrombotic or mechanical factors. 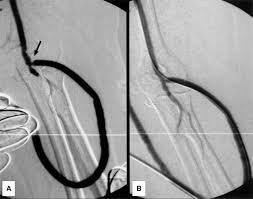 It could be due to the formation of a fibrin sheath within the catheter which acts as a nidus for thrombosis. tPA can restore the patency. 2 mg of tPA in each lumen for 24 hours makes them patent in 80%. If there is a contraindication to the use of tPA then the catheter needs to be changed over a guide wire or the fibrin sheath stripped. What is the role of antibiotics in infected venous access? Treat central tunnel infection without bacteremia with systemic antibiotics na appropriate local measures. Remove catheter if it fails to resolve in 2 weeks of therapy. If there is bactemia in any of these venous accesses start wihtbroad spectrum antibiotics like cefazolin along with gentamycin after the drawing of blood cultures. If the patient is allergic to cefazolin then substitute vancomycin. The sensitive antibiotics are given for 2-4 weeks. Central venous catheters should be removed rather than exchanged over a guide wire if the patient is unstable or symptomatic for over 36 hours. New catheter should not be placed until blood culture taken 48 hours after the cessation of antibiotics has been negative. 60% of the venous access would be AV fistulas. Rate of Graft thormbosis should be less than 0.5 thrombotic episodes per patient year at risk. After the first 2 months the rate of thrombosis should be < 0.25 episodes per patient year at risk. The rate of infection should be below 0.01 episode per patient year at risk for primary AV Fistulas and 0.1 episodes per patient year at risk for AV Grafts. For tunneled cuffed grafts the target rate of systemic infection is < 0.5 episodes per patient year at risk.